Planning a Short-Term SEO Strategy: Is It worth the Trouble? It doesn’t need to be exaggerated that SEO strategists develop search-engine optimized content to accomplish long-term objectives. To put it more simply, if you’ve an online interface for promoting your product or service (apart from the brick-and-mortar outlet), you optimize content for getting a better SERP ranking (read more traffic leading to increased leads and ultimately more sales). This is a strategy or technique you adopt for reaping gains in the long run. However, sales revenues are not consistent throughout the year as there are sudden or gradual spikes and dips depending upon the season. 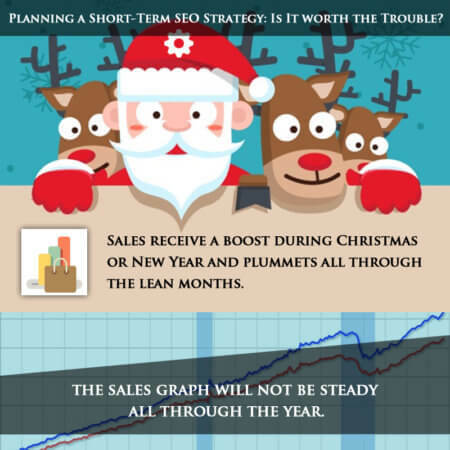 Sales receive a boost during Christmas or New Year and plummets all through the lean months. So do you need to thrash out a short-term or seasonal SEO strategy for maximizing sales during the bullish and bearish months? And even if you do, is it worth all the trouble when you know that the excitement or pessimism will fizzle out in a couple of months? Although many companies are doing their best to catch up with this new fad to make the most out of the festive season, the approach obviously is not without its downsides, apart from the benefits. Depending upon the type of product (or service) you’ve, you can segregate the year into distinct seasons with the interim goal of encouraging sales. You could see a spurt in sales before and after the festive events like Easter, Good Friday, Halloween, and Christmas. Next, you can cash in on national holidays like Labor Day, Independence Day, and so on. Then again, you fall back on ‘end of season’ or ‘stock clearing’ sales during the summers if you’re dealing with seasonal products. And if you’re retailing a product or promoting a service that is trendy and feeds a fad (like a specialized haircutting style or tattoo), then you make hay as long as the sun shines. Regardless of the nature of your business, you’ve to live with the fact that the sales graph will not be steady all through the year. And if you’re like most entrepreneurs, you’d prefer to stick with a long-standing SEO technique instead of one that you’d have to change from month- to- month. Altering the content and tempering blogs with SEO keywords to suit the seasons is tantamount to a tradeoff. Your sales may skyrocket during Yuletide or Halloween but might take a nosedive at other times of the year. The benefit that you get to enjoy is you face less competition as there are not too many competitors around who adopt a short-term approach. However, you’ll have to begin making the changes months before the onset of the festive season as you’d have to wait for your stratagem to be effective. If you introduce the keywords on Christmas Eve then you cannot expect good sales as online shoppers will be done with their shopping by the time your content is ready to deliver. Short-Term SEO Strategy: Should you go for it? Quick-fix SEO strategies may be appropriate only for specific kinds of business. Therefore, you should review whether your product experiences good sales during festivities and holidays, and the degree of competition you confront during the peak/off-peak seasons before opting for a short run SEO policy. Although it might seem to be a great proposition to get desired results in the quickest possible manner, it is always advised to play safe and have a mix of both Long term and Short term SEO strategies running together. In the end both are essential for helping your website or online business grow. Previous PostPrevious Has Google fine-tuned its ranking algorithm?